English soldier and mine-director; born in London 1852. He arrived at the Kimberley diamond fields about 1873, and in dealing in diamonds and claims met with great prosperity. While engaging in business he became an ardent soldier. In 1878 he fought under Sir Charles Warren as an officer in the Diamond Fields Horse throughout the Kaffir war and the Griqualand West rebellion, and was mentioned in despatches for gallantry in the field. In 1896 he successfully led 600 of the Kimberley Rifles against a savage native force at Poquana, a place about 80 miles from Kimberley. 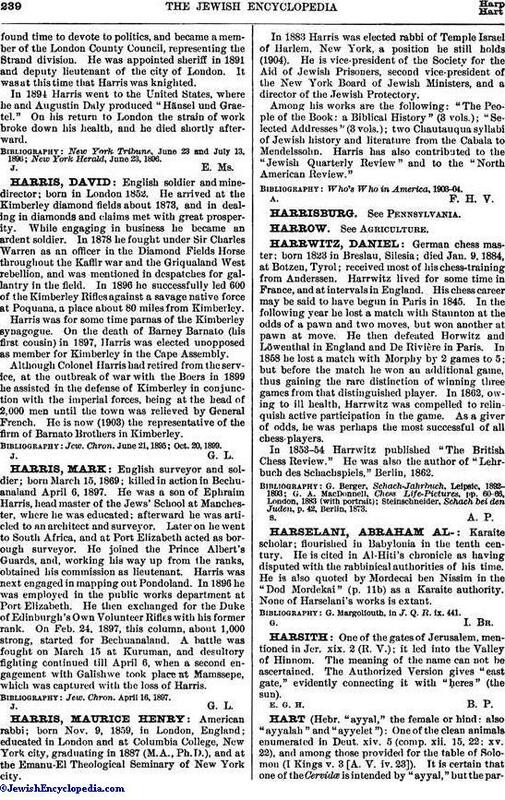 Harris was for some time parnas of the Kimberley synagogue. On the death of Barney Barnato (his first cousin) in 1897, Harris was elected unopposed as member for Kimberley in the Cape Assembly. Although Colonel Harris had retired from the service, at the outbreak of war with the Boers in 1899 he assisted in the defense of Kimberley in conjunction with the imperial forces, being at the head of 2,000 men until the town was relieved by General French. He is now (1903) the representative of the firm of Barnato Brothers in Kimberley. Jew. Chron. June 21, 1895; Oct. 20, 1899.